If you’ve ever listened to an audiobook, chances are you’ve had someone tell you it’s “cheating” or not “real” reading. Using the word cheating implies that there is an end goal to reading. For many of us, our early experiences of reading was at school, where we read books and got tested on how well we understood the text. However, while learning to read like this has a place, reading is also a fun pastime at any age. Most reading isn’t tested, so listening to an audiobook doesn’t mean shirking effort! When I think of my favourite books, I don’t think of how good I felt about the act of reading the book. I think about the wonder and fun I had experiencing the story, the emotions I felt, or the fascination in learning something new. None of these things would be made more valid by reading a physical book over an ebook or audiobook. Sure, there will always be people with a superiority complex who think that books are the only authentic way to read, but they won’t be awarded the ‘most valid reader’ prize at the end. Reading is a fun experience for everyone. It’s not how you read, it’s that you read! However you enjoy accessing stories is the right way to read. Image Description: A young girl sitting with an open book resting on her legs. The book is giving off a magical light as she looks at it. In an era where technology seems to be everywhere, books represent a simpler time. They feel like a callback to an era before social media and videos of robots that are able to open doors. Books are a physical presence in bookshelves and a reminder of reading experiences. However, the increasing popularity of audiobooks isn’t a threat to print books (despite the inevitable headlines that say they are). Audiobooks, just like print books, are all about the experience. Where print books are tactile and visual, audiobooks are aural. There’s something reverent about putting on an audiobook. It’s relaxing to let the narrators voice wash over you while you listen to the story. Many people first learnt to read by listening to someone else read to them, and audiobooks can replicate this feeling. They’re an immersive experience. However, publishers aren’t going to stop printing books in response to audiobooks becoming more popular. Just like ebooks, people who enjoy reading in that format will continue to do so, while people who enjoy print books will continue to buy them. Despite this desire to go back to a simpler time, silent reading isn’t as established as you might think. In a previous Listening Books interview with UCL Professor John Mullan, he mentions that in many famous novels characters read aloud: ‘Famously in Northanger Abbey when Catherine Morland and the ghastly Isabella Thorpe retire together on a rainy day in Bath to read novels together that doesn’t mean they’re silently sitting there; it means they’re reading bits aloud to each other.’ Jane Austen read her novels aloud to her family to road test them, and even when Charles Dickens was writing, a great deal of reading was done aloud. Charles Dickens Doing a Public Reading in 1867. Reading individually and silently is a great personal experience. However, listening to someone read can be just as enjoyable, especially for classic authors who probably designed their writing to be read aloud. In a 2016 blog, University of Virginia psychologist Daniel Willingham investigates the idea that your mind does the same thing whether you’re listening to an audiobook or reading a print book, and concludes that in most cases it’s exactly the same. There are two things that happen during reading: decoding and language processing. Decoding is knowing what word each combination of letters is creating. Language processing is understanding those words. There have been many studies looking at whether understanding is any different depending on reading or listening. A 1977 study tested 48 college students by giving them three tape-recorded stories and printed stories and asking them to write a written summary of them. It concluded that ‘the shared content of the summaries remained remarkably unchanged.’ So, if you’re listening to a story, you’re gaining exactly the same understanding of a story as if you’re reading it. Case Closed? Well, Daniel Willingham goes a bit further. Audiobooks take away the decoding element of reading. For many skilled adult readers, decoding doesn’t feel like a lot of effort. But for someone with dyslexia, trouble decoding can seriously affect the time it takes to get to the comprehension stage. This removes any enjoyment in a story and makes it a chore. 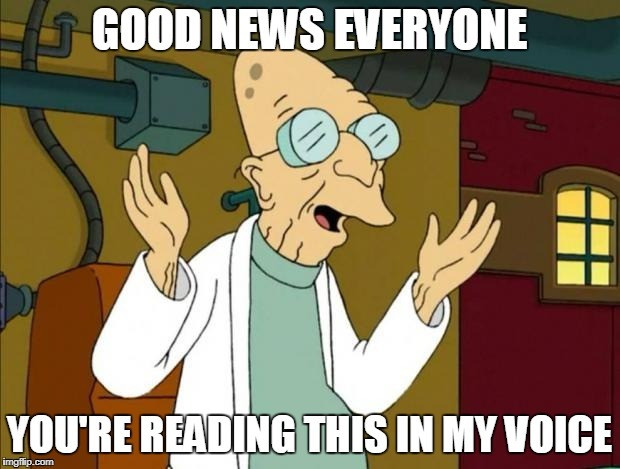 Image Description: Professor Farnsworth from Futurama with the caption: Good news everyone! You’re reading this in my voice! He also suggests that the addition of a narrator can be very beneficial. We hear voices in our heads while we read, but this doesn’t always help with comprehension. For example, the words ‘of course that’s fine’ can mean very different things. They could mean that something is genuinely fine, but with a slight change in emphasis they could suddenly be a sarcastic comment indicating something is not fine at all. A narrator communicates this difference through tone of voice. According to Willingham, listening to an audiobook can therefore contain more information that could benefit an autistic person who struggles to understand ambiguous words or sentences. I’ve seen lots of defences of calling audiobooks cheating. They usually go something like this: Well, I don’t mind disabled people listening to audiobooks. What I mean is that perfectly able people who use audiobooks are cheating. However, this attitude doesn’t take into account the thousands of people who have conditions that make reading different that aren’t immediately obvious. Dyslexia, ME/CFS, and even depression can affect how difficult it is to decode words or hold up books for long periods. Where do you draw the line? How disabled do people have to be before it isn’t “cheating” to listen to audiobooks anymore? Plenty of “invisible” illnesses affect people’s daily lives in many ways that aren’t obvious from looking at them. Calling audiobooks cheating may put someone off from looking for or listening to audiobooks. If reading books has become too difficult, then this means they’ll miss out on reading altogether. And no one wants that to happen! Are you convinced that listening to audiobooks counts as reading? Let us know in the comments! If you have an illness, disability, learning difficulty or mental health issue that makes reading print or holding a book difficult, Listening Books can help. We are a UK charity providing an audiobook library for anyone with a print impairment. Membership starts from just £20 per year to listen to 10 books a week! Find out more at our website. You can also find out more about our free membership options. A case well very well made for audio books. We’re coming full circle in reading aloud becoming a shared experience again, whether the recorded narrator reads to one or several people at any one time. Those who regard books being recorded as a form of ‘cheating’ are so behind the times. Consider all the ‘time poor’ and the frustrated commuters in cars and trains plugged in to audio books on their journeys, or carrying out mundane domestic tasks. More and more people are Opening up into book worlds and authors busy lives leave them no time for unless on the move. audio books are happily being discovered by anyone and everyone.